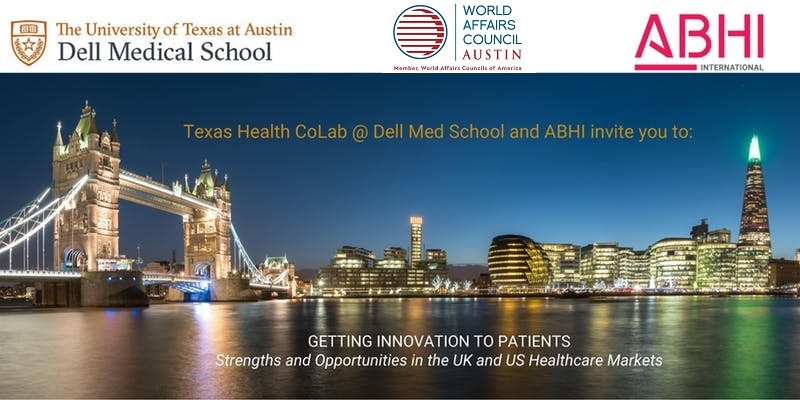 Dell Medical School and the Association of British HealthTech Industries, in collaboration with the World Affairs Council of Austin, will provide insights and approaches to innovation pathways and market access in the UK, as well as exploring what lessons can be taken from both sides of the Atlantic to improve patient outcomes. After the discussion, there will also be an informal networking session. The UK’s National Health Service (NHS) is the world’s largest single payer health system, employing over 1.5 million people and serving a population of over 65 million, providing care from cradle to grave and free at the point of need. Each week, the system deals with over 4.7 million patients and has been ranked ‘No. 1 Healthcare System’, topping the Commonwealth Fund health think tank in recent years. The UK is home to an exceptionally strong science base, with many of the world’s top universities and research institutions excelling in the areas of discovery science and engineering. Coupled with a vibrant health technology and life sciences sector, worth over $90 Billion per annum, the UK has a huge amount to offer and is looking for partnerships and collaborations in the US. In this unique event at The Dell Medical School, we invite you to hear from, and engage with UK experts and US experts alike, who will share insights and approaches to innovation pathways and market access and explore what learnings can be taken from both sides of the Atlantic to achieve the triple aim. 1501 Red River Street, Austin, TX, 78712, United States.